Edward Scissorhands and I go way back. I’ve been a big fan of the 1990 Tim Burton film for a long time and even used it as inspiration for a project whilst at university back in 2008. Unfortunately that particular idea didn’t end up working out and whilst I still love the story I haven’t watched the film since. I always thought that one day I would revisit the characters and the story however I never imagined it would be through a graphic novel. A few months ago I noticed the cover for this book pop up on Netgalley and couldn't resist taking the opportunity to snap it up, and I'm happy to say that I'm glad I did! As this is an adaptation of a film with such a distinctive style I want to kick off by talking about the visuals. I have to say I honestly really loved the style of the illustrations in this book, particularly those of Edward and the interior of his castle, which I preferred over the more brightly coloured scenes set outside of his lonely world. With reference to the original film the illustrations had a bit of a Burton-esque feel to them and I really felt that Drew Rausch’s style was perfectly suited to this quirky project. With this in mind I would really love to re-read the story, perhaps next time as a physical book, to catch all of the little details I must have missed first time around. As for the story itself it’s important to first note that Parts Unknown is not a re-telling of the film’s plot but is actually a sequel. Set years into the future we are introduced to teenager Meg who is the granddaughter of Kim (Wynona Ryder’s character in the film). The plot follows Meg as she looks for Edward and tries to prove that her late grandmother’s tales of the mysterious but lovable character are more than just make-believe. Another new character is introduced in the form of Eli, one of the inventor’s failed projects who becomes the villain of this piece, an interesting twist on the events of the original story. Personally I loved that this graphic novel offered a different spin on the world of Edward and brought new life to the character so many fans love. It also gave an interesting insight into what could have happened after the events of the film or what we may have seen if there had been a cinematic sequel. I did however feel like the story could have been padded out a little more, although I understand that this isn’t always easy with the format of a graphic novel. 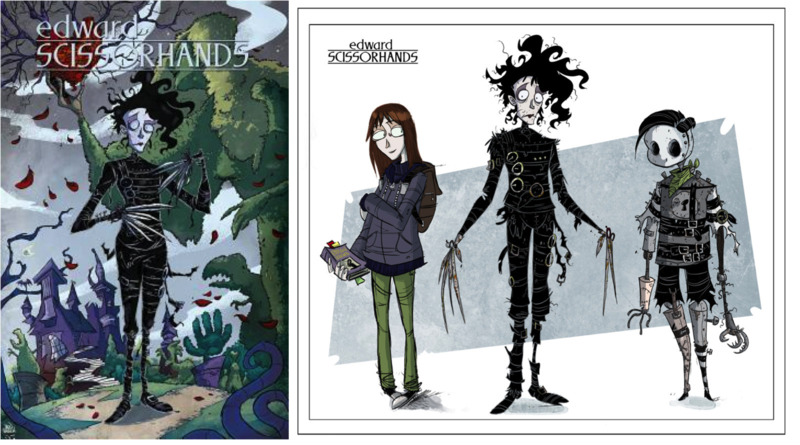 Overall I think Edward Scissorhands Volume 1: Parts Unknown is a great little graphic novel and love that the story of Edward is being shared with a new generation. As it looks like this is just part one of a planned series I’m really looking forward to finding out where the story will go in the next instalment and what future adventures Edward and Meg may go on together! This review was originally published over on my blog e-elise etc in May. Don't forget to check back here tomorrow to read my review of Edward Scissorhands Volume 2: Whole Again!